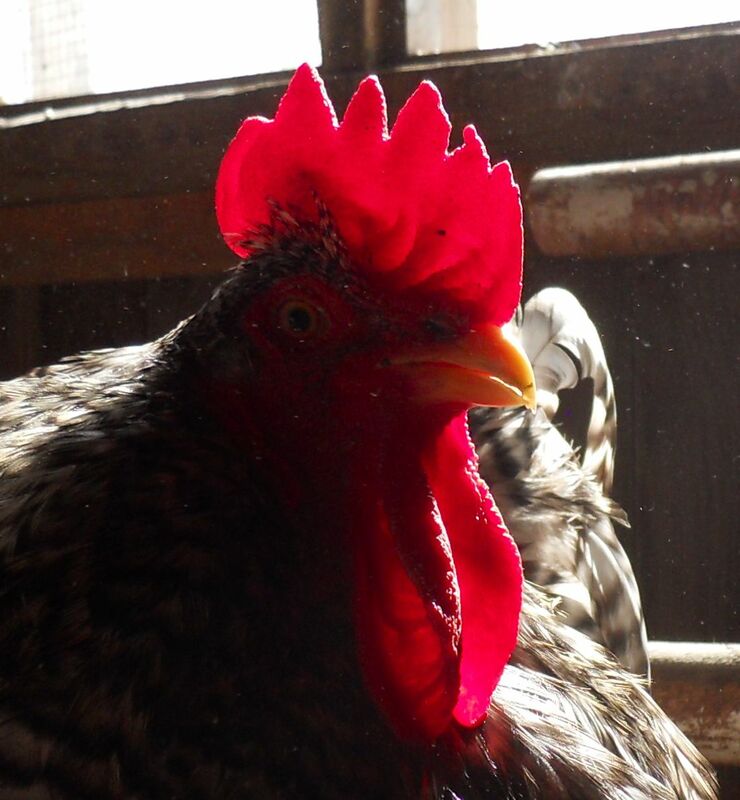 Life at Busy Solitude Farm: Will Egglebert Retire? Egglebert came to Busy Solitude Farm in the first chicken year. I had ordered four Cuckoo Marans pullets in a joint order with a friend. It soon became clear that one of the four was more manly than the others. No problem, thought I, every flock should have a rooster. As the chickens of reached maturity, Eggy came into his protective own. He would chase me out of the barn willingly enough and without provocation. The summer of 2007 brought his first chick, when Chick-Chuck hatched to the ill-fated yellow hen who was murdered just weeks later. The next year I added a second rooster to the flock, hoping to boost the number of chicks we could hatch. Tweedledum was a fighter and eventually had to be dispatched to keep peace. Which leads us to the latest development. My naivete about hatching chicks failed to acknowledge that 50 percent of them would be roosters. 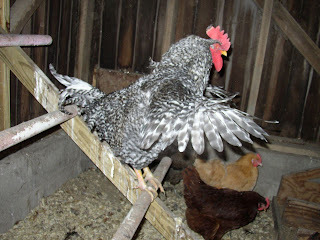 After a fruitful 2010 of hatches, there are a total of five roosters in the barn, and only one new hen. (There are also two male ducks to one female duck, alas.) All was well for a while. But yesterday someone attacked Egglebert. I think it was his son, Eggy Jr. When I came into the barn I discovered Egglebert with his head and neck stuck through the gap of the gate. He'd tried so hard to get out that the gate was jammed and it took some maneuvering for me to open it. He stayed so still I thought he was dead, but when I turned my back he sped out the gate into the greater barn. I fed the hens, then looked around and found him hiding. He was petrified. I let him stay out there for a while, placing food and water near him. 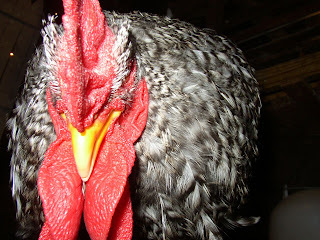 Then later in the evening I retrieved him (by then he was standing up) and moved him into the isolation pen in the coop. Eggy Jr. raised a ruckus when he saw his father returning, and Egglebert was clearly frightened until he recognized that he was protected from attack. So now I have a situation that must be addressed. If Egglebert would graciously step down as top rooster, would Eggy Jr. allow him to stay? I watch enough PBS documentaries to know that some species allow that to happen, but some don't. Will he need to be separated for the rest of his life? If so, the configuration of coop space needs to be rethought. For the time being, Egglebert will stay in isolation. 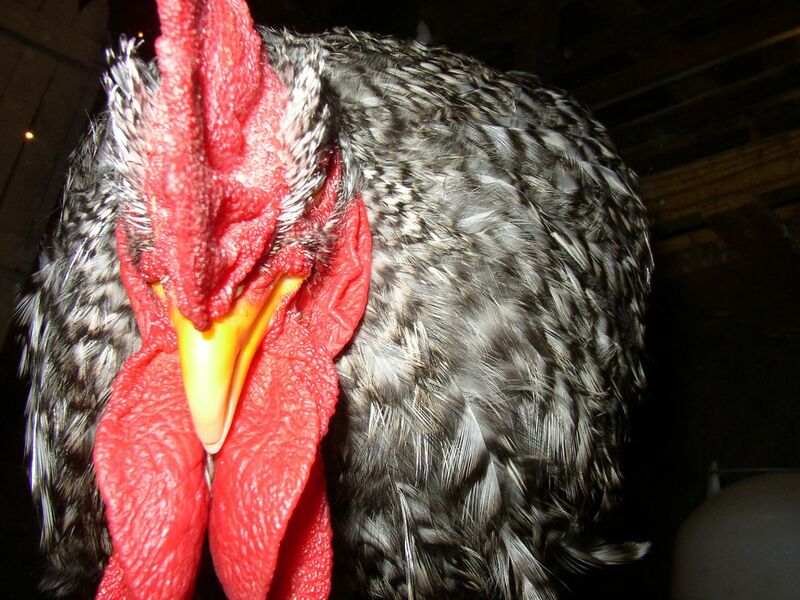 I will acknowledge that five roosters is too many in my small flock, and something will need to be done. But for now, it is Christmas. Once one rejects the other it cannot be put back in. It doesn't matter if the older one will submit or not. The new one has him marked as a competitor and threat to his own status. Sorry. Since we don't want fertile eggs and ended up with 4 roos, they are all in separate kennels. Once chickens get something stuck in their heads, that's it. They don't change their minds about getting along. Matt put it simply and well.